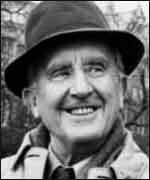 J R R Tolkien (1892 – 1973) English author, philologist and poet. Tolkien was best known for his fantasy creations of Middle-Earth – writing The Hobbit, and the epic trilogy ‘The Lord of the Rings’. The Lord of the Rings made him one of the best selling authors of the Twentieth Century, spawning a new genre of fantasy. J.R.R. 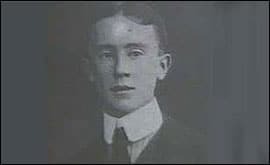 Tolkien was born in 1892, Bloemfontein, South Africa. After three years in South Africa, he returned to England with his Mother Mabel; unfortunately, his father died one year later, leaving him with little memory of his father. His early childhood was, by all accounts, a happy one; he was brought up in the Warwickshire countryside (many regard this idealised upbringing as the basis for the Shire in Lord of the Rings). In 1904, when John was just 12, his mother Mabel died from diabetes leaving a profound mark on him and his brother. After his mother’s passing, he was brought up by the family’s Catholic priest, Father Francis Morgen. From an early age, J.R.R. Tolkien was an excellent scholar, with an unusually specialised interest in languages. He enjoyed studying languages especially Greek, Anglo Saxon, and later at Oxford, Finnish. Although a scholar at King Edward VI school, he initially failed to win a scholarship to Oxford. This was partly due to falling in love with his childhood sweetheart Edith. On finding out about this romance, his guardian Father Francis Morgan, prohibited John from seeing Edith until he was 21 and no longer under his care. Father Morgen made John promise not to see Edith, and John reluctantly agreed to his request. John faithfully waited until his 21st birthday, and on this date, he renewed his contact with Edith and successfully persuaded her to marry him. It is a testament to his belief in faithfulness and honesty that he was willing to wait several years to meet his wife; such sentiments of nobility frequently appear in his writings; for example, the magnificent love story of ‘Beren and Luthien’ (The Silmarillion 1977). From an academic point of view, his separation from Edith seemed to do the trick, and a year later he won an exhibition at Exeter College, Oxford where he would study classics. John did not particularly shine in this subject and grew to enjoy the pleasures of University life, though his meagre income made it difficult to keep up with the spending habits of more affluent students. Uninspired by the classics, John was able to switch to his real love – English literature. He was a competent scholar, but a lot of his time was spent researching other languages in the Bodleian library. It was here in Oxford that he became fascinated with Finnish, a language which would form the basis for Quenya; a language he would later give to his Elves. His love of languages remained with Tolkien throughout his life; in particular, he began developing his own languages, a remarkable undertaking. In fact, he later commented that languages lied at the heart of his Middle Earth creations. 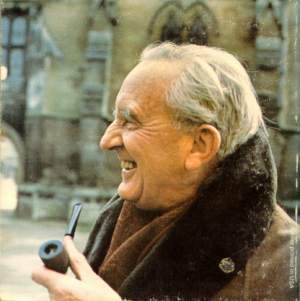 Tolkien said the stories existed to provide an opportunity to use the languages. Devotees of the book may not agree, but it does illustrate the profound importance he attached to the use of language. At the outbreak of the First World War, J.R.R. Tolkien decided to finish off his degree before enlisting in 1916. Joining the Lancashire Fusiliers, he made it to the Western Front just before the great Somme offensive. At first hand, J.R.R. Tolkien witnessed the horrors and carnage of the “Great War”; he lost many close friends, tellingly he remarked “By 1918 all but one of my close friends were dead”. J.R.R. Tolkien survived, mainly due to the persistent re-occurrence of trench fever, which saw him invalided back to England. He rarely talked about his experiences directly, but the large-scale horrors of war will undoubtedly have influenced his writings in some way. Perhaps the imagery for the wastelands of Mordor may have had a birth in the muddy horrors of the Western Front. 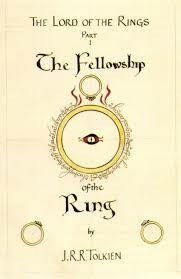 It was back in England, in 1917, that J.R.R Tolkien began working on his epic – “The Silmarillion“. The Silmarillion lies at the heart of all Tolkien’s mythology, it is a work he continually revised until his death in 1973. The Silmarillion makes hard reading, in that, it is not plot driven, but depicts the history of a universe, through an almost biblical overview. It moves from the Creation of the Universe to the introduction of evil and the rebellion of the Noldor. It is in The Silmarillion that many roots from the Lord of the Rings stem. It gives the Lord of the Rings the impression of a real epic. It becomes not just a story, but also the history of an entire world and peoples. Initially, J.R.R Tolkien’s writings on The Silmarillion were known by very few. He found his time absorbed in teaching and other duties of being a professor. He also found time to write important papers on medieval literature. These included seminal works on, Sir Gawain and the Green Knight, and Beowulf. In 1945, he was given the Merton professorship and gained additional duties of teaching and lecturing. It was sometime after 1930 that Tolkien gained an unexpected inspiration to start writing the Hobbit. It was whilst marking an examination paper that he jotted in the margins of a paper the immortal words; “In a hole in the ground lived a hobbit.” Unlike the Silmarillion, The Hobbit was a simple fairy tale and adventure for children. Hinting at evil things, it still ends in a happy ending for all and is primarily concerned with a triumph of good over evil. In the course of the next few years friends, including C.S. Lewis, read his manuscript and gave good reviews. In the course of time, the publisher Allen and Unwin were sent a copy. Rayner, the 10-year-old son of Mr Unwin, gave a glowing reference and the Hobbit was published in 1937 to great commercial success. Due to the success of The Hobbit, Allen and Unwin encouraged J.R.R. Tolkien to write a sequel. Thus, over a period of many years, J.R.R. Tolkien began writing The Lord of the Rings. This soon became quite different to The Hobbit, both in scope and dimension. Putting its roots into the characters and history of The Silmarillion, it became an epic of unprecedented depth. No longer was Tolkien writing a simplistic adventure story; in The Lord of the Rings, the triumph of good over evil is no longer so complete. Even with the mission’s success, there is no obvious happy ending. There is a feeling of permanent change – nothing can remain as it is. As well as being a fascinating storyline, the book deals with many issues of how people respond to certain choices and the influence of power and ego. It can be read in many ways, but it does offer an underlying moral and spiritual dimension, which is inherent in the development of the story. Due to the sheer scope and length of the book, the publishers Allen and Unwin were wary of publication. They worried about whether it would be a commercial success. 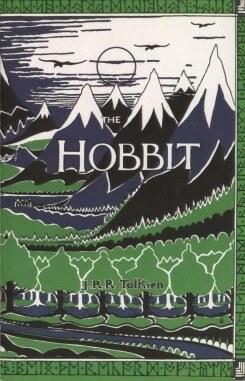 Eventually, they decided to publish the book, but split it up into six sections; they also offered no payment to J.R.R Tolkien, until the book moved into profit. The first edition was published in 1954 and soon became a good seller. However, it was in 1965 when the book was published in America, that it really took off becoming an international bestseller. Somehow the book managed to capture the mood of the 1960s counterculture, and it became immensely popular on American campuses. Tolkien became a household name, and The Lord of the Rings would soon become renowned as the most popular book of all time. Although the book has received the most powerful popular acclaim, it has not always received the same commendation from the literary world. In 1972, Oxford University conferred on Tolkien the honorary degree of Doctor of Letters. This was not for his writing, but his researches on linguistic studies. Tolkien, however, would have taken no offence at this award. For Tolkien, his linguistic studies were as important if not more so than his fictional literary endeavours. He did not particularly enjoy the fame that came from his literary success, and in 1968 he moved to Poole to gain a little more privacy. Speaking of his own simple tastes he described his similarity to hobbits. His wife Edith died in 1971, and J.R.R. Tolkien died a couple of years later in 1973. After his death, his creations gained increased popularity and sales. Even before the release of The Lord of the Rings films, the book, “Lord of the Rings” was often voted as best-loved books of all time. His son, Christopher Tolkien, carefully went through all his manuscripts, and published posthumously several histories of middle earth, encompassing various early drafts of stories and histories.